On short notice, the Genship downriver team responds to an emergency repair situation. 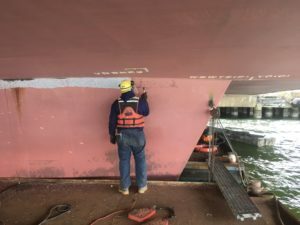 A Ro-Ro ship’s rudder trunk had cracked welds on 60% of the circumference at the hull attachment. Small work floats and portable welding and air-arc equipment were towed to the vessel at its cargo berth, Dundalk Marine Terminal. The floats were secured to either side of the rudder trunk. 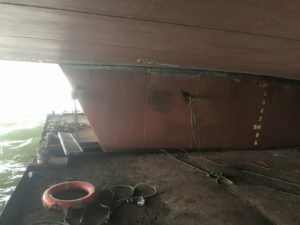 We developed a procedure with the Class Surveyor to gouge out and re-weld the vessel’s shell to the rudder trunk. 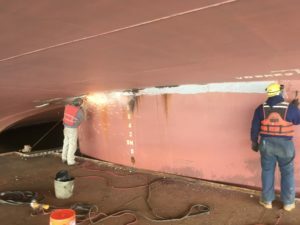 Our crews worked 24 hours a day for seven days to complete the repairs while the ship was off-loading and loading its cargo.